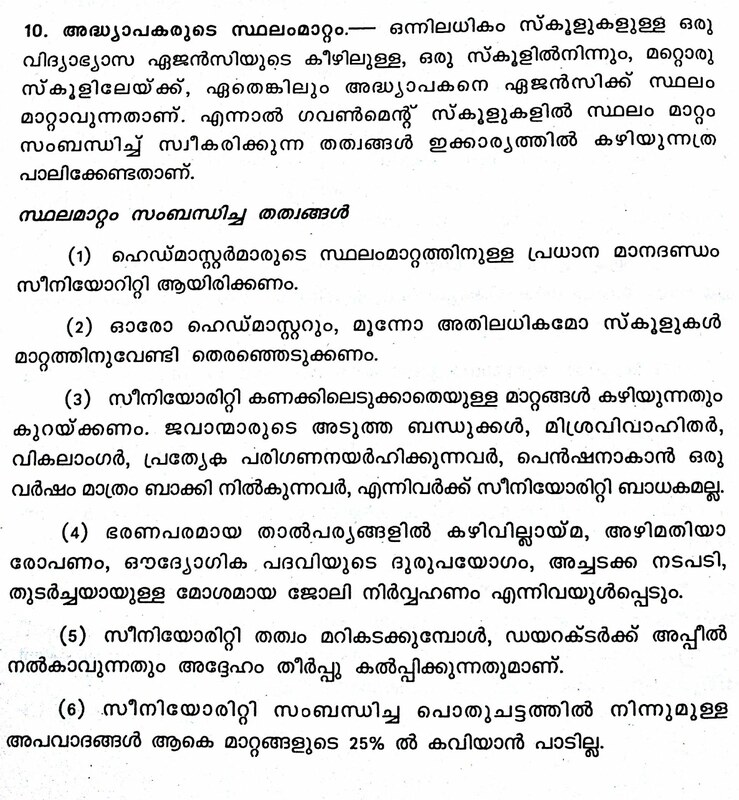 The State of Kerala had already reduced the internship for nursing students to six months from the pre- existing one year on representations from various quarters. The State should also come forward to reduce the one year compulsory nursing service for students, taking account of the situation of their plight of not getting enough payment. Obviously, the employers cannot be cornered for the reason that, they are not paying good wages to those persons who are enrolled in their hospitals for completing their compulsory internship and nursing service. A similar order for reducing the compulsory service is also mandated in tune with the earlier GO which reduces the internship for the betterment of the nursing community. 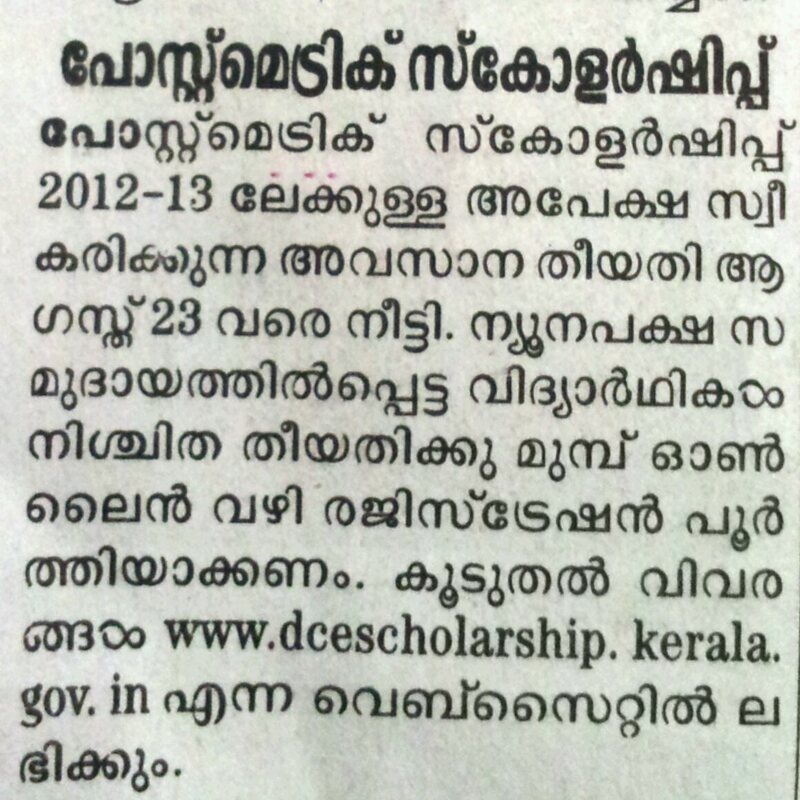 NATIONAL RURAL EMPLOYMENT SCHEME- Kerala Government issued additional circular to make the accounts transparent. 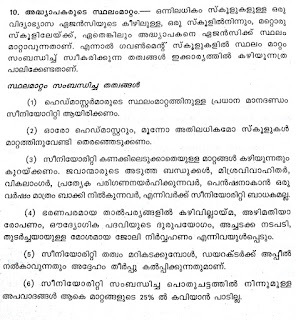 The Kerala Local Self Government issued an additional circular to the local bodies to publish the entire account for more transparency. 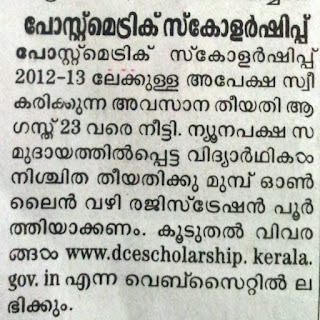 POST MATRIC SCHOLARSHIP FOR MINORITY STUDENTS 2012-2013: DATE EXTENDED UP TO AUG 23RD. Missing persons...legal benefits to be given to the heirs. 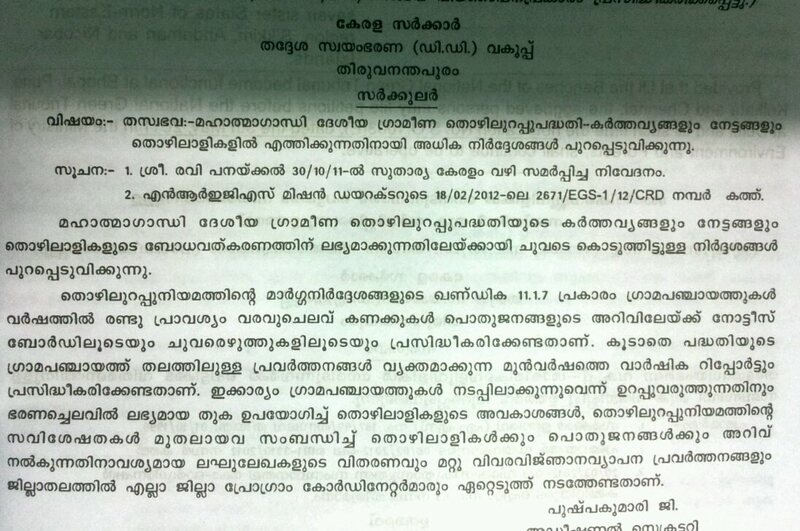 New judgement from High Court of Kerala. 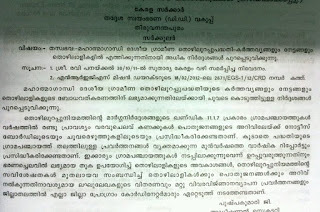 The direction of the Supreme Court to prohibit the use of tinted sun film in motor cars are not implemented uniformly. Even some of the Government vehicles are still plying with the tinted film. All the Director Generals of Police of all States are directed to implement the Judgment in strict sense. 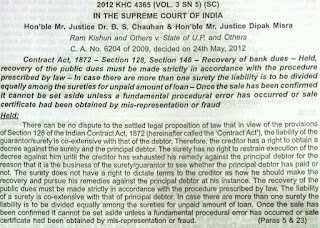 Non compliance of the same would invite contempt of Court. Article 141 of the Constitution of India says the law declared by the Supreme Court would be the law of the land binding on all and must be enforced in terms thereof. The cause of any inconvenience is not a ground for rendering a provision on the statute to be uneforceable. I.A. No. 4/5/6/7/8/9/10/11/12/13/14/15 IN WP(C) 265 OF 2011 dated 3.8.2012. 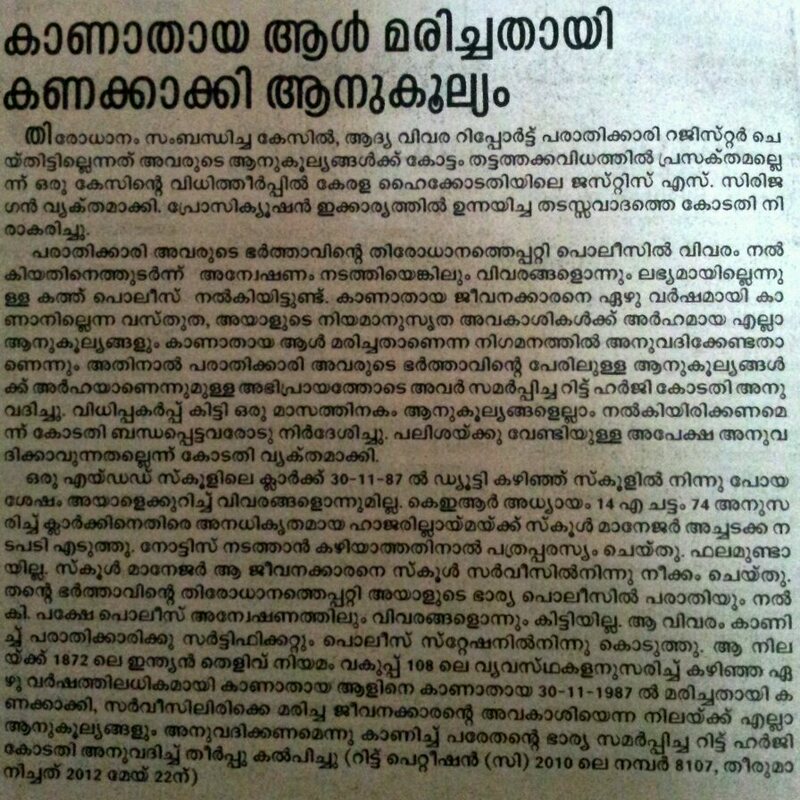 ISO CERTIFICATION AND TRADEMARK REGISTRATION with LEGAL BACK UP - KERALA..
Don't open e-mails or attachments from unknown sources. Be suspicious of any unexpected e-mail attachment, even if it appears to be from someone you know. Protect your computer from Internet intruders. Use firewalls. Regularly download security updates and patches for operating systems and other software. Use hard-to-guess passwords. Mix upper and lower case letters, numbers and other characters, and make sure they are at least eight characters long. Back up your computer data on disks or CDs regularly. Don't share access to your computer with strangers. Learn about file-sharing risks. Disconnect from the Internet when not in use. Check your security on a regular basis. When you change your clocks for daylight-savings time, reevaluate your computer security. Make sure all family members know what to do if the home computer becomes infected. While we make every attempt to protect our surfers from virus attacks and other malware, essential protection from viruses, hackers, and privacy threats is critical for online business owners. There are a lot of viruses out there. But some aren't really out there at all! Following is some helpful information to research virus and virus hoax information, and some free programs to help you fight the constant threats. Several reputable virus software companies provide up-to-date information on the latest virus threats. Many of our members successfully use these free virus protection programs and they have all been reviewed by reputable sites. However, as with all freeware programs, there are no guarantees that they will not conflict with other programs on your computer. Work as a team to set your boundaries. Discuss with your child exactly what is OK and what is not OK regarding what kind of Web sites are appropriate for them to visit, which chat rooms to visit and what kinds of things to talk about there. Set logical consequences for when your child disregards your rules (like grounded from the Internet for 1 week), but do NOT threaten to ban the Internet forever. Stress to your child that they need to tell you if they get any weird or upsetting messages while chatting, and that you will not be angry with them nor will you ban the Internet as a result. Make it clear to the child that you understand that the child cannot control what other people say to him or her and that they are not to blame if this happens. Take an active interest in your child's activity online. Do NOT use the Internet as a babysitter! Learn to surf the Web and chat online yourself so you understand what it is that your child is doing. If you don't know how to chat online, ask your child to teach you! 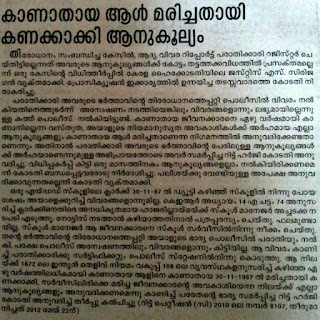 The recent issue in Kerala which resulted in the arrest of Mr. Jayarajan the Kannur District Secretary of CPI M, has evoked a controversy among the members of the legislature itself. Even the CM and the Home Minister repeatedly reiterated that phone calls of none of the MLAs were tapped. At the same time, the investigating agency says, they got special sanction as per the provisions of PROCEDURE AND SAFE GAURD FOR INTERCEPTION, MONITORING AND DECRYPTION OF INFORMATION RULES 2009, formulated under section 87(2)(y) of Information Technology Act. However, it is in the air that, whether phone calls can be tapped as part of the investigation. The above referred rules give the provision for taking evidence from the calls, provided it must be with the permission from the competent authority, viz., from the Home Secretary.